Well in this installment of “My Featured Website”, I thought I would feature Newegg.com. One reason I thought I would feature this website is because I love electronics of all kinds, especially computers and Newegg has tons of awesome things for an electronics enthusiast to check out. If you love electronics, especially then this is a MUST SEE website. 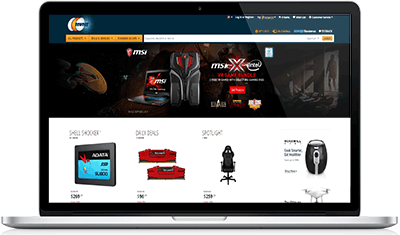 Newegg has been around well over a decade and is one of the top online electronics retailers, specializing in computer hardware and software. I have been shopping at Newegg for quite a while and they always have great prices on the products they carry. What sets them apart is how great their customer service is and how well they operate. If you ever order anything from them, it is shipped out very quickly and very well packaged. This means a lot since they sell a lot of computer hardware that doesn’t respond well to being handled roughly. I have never received anything that had any damage of any kind. Kudos to their packaging department! Recently I had decided to upgrade my RAM since my sweet Lenovo laptop computer was lagging a bit due to me using way too many programs at the same time, including Adobe PhotoShop which loves to eat up available RAM. I shopped around as I always do and found what I was looking for at a few sites but as most of the time, Newegg.com was cheaper. I placed my order which was supposed to take 3-5 days and went on about my life. To my much appreciated surprise, my new RAM upgrade arrived in only 2 days. Which was greatly appreciated since I was growing tired of the lagging I was not used to from my computer. It was very well packaged and arrived safely for me to install. After the install my laptop was running like a champ again, even with all my memory hogging programs running at the same time. Anyway, back to my write up about Newegg.com. Their website has all kinds of goodies for an eGeek (an electronics enthusiast) to check out. They have all kinds of things from PC’s to Solid State Drives (SSD’s) to headphones for your MP3 player and just about everything in between. Newegg even has a great return policy, though I have never needed it, it is always nice to have that piece of mind. Newegg.com has a trade-in program for some things, they have gift cards and they even have product reviews and videos on many products to help you find out more about an item you might be interested in. One of my favorite features is their product search feature. Using this you can go into a category of products and then use the many filters to help you find exactly what you are looking for. Newegg.com is really a great website to check out if you love electronics, especially computers like me. Even if you aren’t an eGeek like me, and you are just looking for a new PC, part for your laptop or anything else electronic you should check them out. Their prices, products and services are top notch! If you have a comment or question about Newegg.com then please feel free to leave me a message below, I always welcome the input of my website visitors.